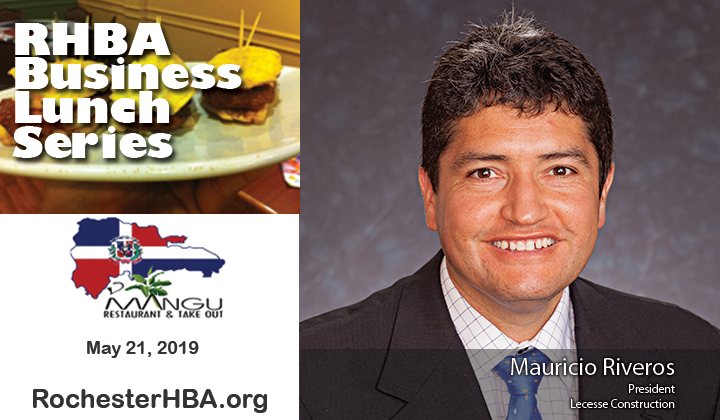 Join us at the D’Mangu Restaurant for our May Business lunch event featuring Mauricio Riveros! Mauricio serves as President of LECESSE Construction Services. Mauricio directs the day-to-day operations of the company, formulating plans and policies to achieve overall corporate objectives, ensuring profitable growth and fulfilling the company’s commitment to the community. Mauricio also serves as Chief Innovation Officer at the Pike Companies. His responsibilities include the development and implementation of all Shared Services for Pike-LECESSE. Mauricio is committed to raising the bar of operational excellence by streamlining efficiencies, standardizing best practices, and challenging construction and renovation projects to adhere to the highest safety and quality standards. He has also received multiple recognitions and awards for his work in business and in the Hispanic community. In 2014, Mauricio received the Hispanic Businessperson of the Year Award from the Rochester Hispanic Business Association and he was recognized in the Rochester Business Journal’s “Forty Under 40” in the same year. Currently Mauricio hosts a radio program and TV show for the entrepreneur community in Rochester. Mauricio obtained his formal education in Bolivia and holds a Master of Economic Law from La Universidad Andina Simon Bolivar and a Law Degree from La Universidad Catolica Boliviana. Mauricio resides in Fairport, New York with his wife, Bess, and children, Thomas, Oliver and Wesson. Seating is very limited, pre-registration is required.